Find a better radio mic for this price and we'll eat our hats. Easy to use, good quality. Only one frequency available, no mic clip, no XLR output, not very sturdy. When it comes to buying musical gear, everybody loves a good deal. This Gear4Music radio mic is the cheapest such system we've ever come across. Should we be camping outside the figurative shop to bag a bargain, or should we be saving our pennies up to invest in something better? As you would expect for this price, this is not the most robust of systems. Both mic and receiver are made from thin plastic and are not going to withstand the rigours of a rock 'n' roll life on the road. There is no mic clip included. Finding one the right size to do the job well will probably add another £10 to the system price. It would be worth Gear4Music including a mic clip in the package to solve this annoying problem, even if meant charging a couple of quid more. The setup of the system couldn't be easier. It's very much 'plug and play', so it is up and running in seconds. The result is of a surprisingly high quality and is comparable to that of much more expensive systems. The only downside is some handling noise, but for this price, the mic is simply stunning. It sounds good, the range is very good and the price is phenomenal. For the price you will not find better. Although radio systems in the GHz range are becoming more popular, systems are, in the majority, UHF, even at the budget end. This system, however, is rather more old school and operates in the VHF frequency range at 175MHz. A few years ago this would have caused problems as the world and his wife were also trying to use radio microphones and guitar systems in this range. As most systems are now not VHF, a gap has been created of which Gear4Music has taken advantage. VHF technology may be old, but it's cheap and it still works. The main reason VHF had such a poor press was due to its range being cluttered. Improvements in technology will have made the radio transmission better quality and more accurate. As the system is only available on one frequency it would not be possible to expand to two or more systems in the future. 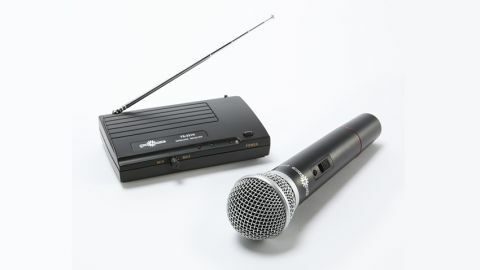 That said, the system would work well for karaoke and soloists with backing tracks, but equally, would fit the bill for seminars, hotels and places of worship. As a cheap, entry-level radio mic, the TS-331H does what it says on the tin admirably. For the price, we can't fault it.